This set of photos was taken on March 9, 2018 at 6:10: AM. The location was in the Georgetown area of Washington DC. 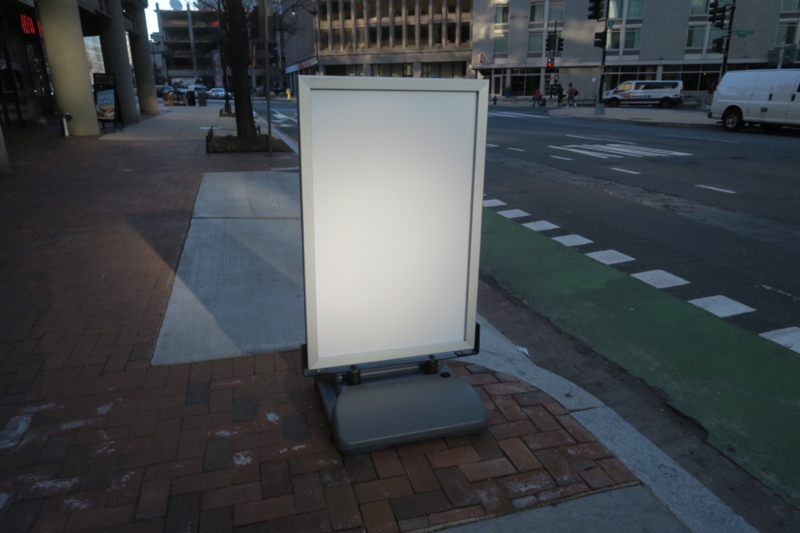 The "Take It!” moment happened as I was walking on the sidewalk doing my usual commute from one Hotel to another, when I noticed a blank white sign in a free standing frame that seemed to be glowing. I stepped up to it and stuck out my hand in front of it to see if a shadow would be cast from a slight source, and indeed there was a shadow found. I then turned and looked back up the street to see if I could find the light's starting point. 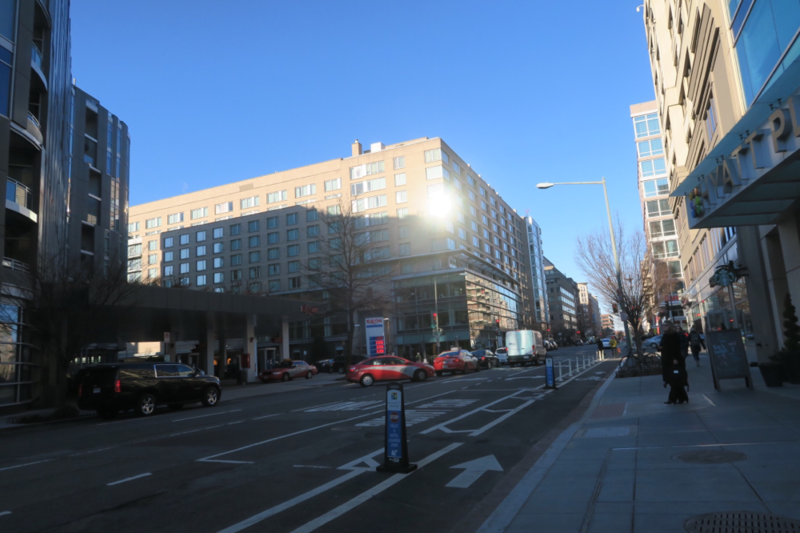 It took a fraction of a second to see the location of the window on a high rise upon which the sun was reflected with the alignment resulting in the glowing blank sign in front of me, on the sidewalk, which was about two blocks away. Several factors played important parts in this unusual find. The first being that the free standing sign was out on the sidewalk at the early hour and oddly had nothing written on the face of it providing a plain blank white surface* for the reflected sun to somehow manage to perfectly hit. The white surface was flat in texture and offered no gloss as an assist. 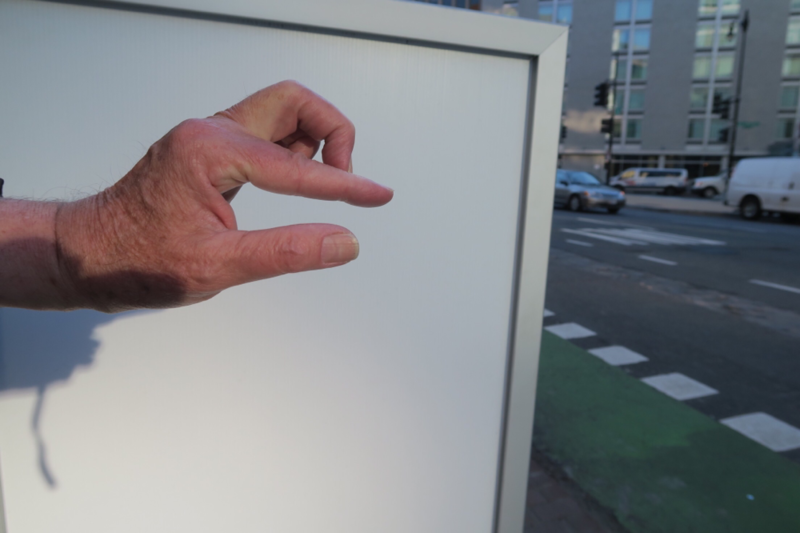 I took a selfie of my left hand with the hope of catching an image of the shadow cast as a result of my hand placement, and did not have the camera placed correctly to make the catch. I assure you the shadow was there. After reviewing the photos at home, I pledged to do what I could to be back in the same location at the same time on the next morning to see if the sign was again out there in blank form and the sky cloudless enough to permit a repeat of the sun's reflective show and another match up produced to allow me another chance at a capture using the same hand shadow puppet of the finger formed goose head with its opening and closing mouth capability. The After Take: This will be perhaps a first in this category as am going back to see if I can gather in some more of this rare line up with an opportunity to possibly "fill in the blank” with more attention to hand placement with my camera in lining up the shot. I will pass along the results of this hopeful quest in the form of a PS to this original write up and with luck being in full play, be able to include some of the resulting photos. This will not be the first time I have wished myself some luck in advance of engaging in one of life's little, but fun challenges. Thank you for joining me in this surprise filled journey. That's kind of strange. A sign out on the street completely blank like that. So the shadow was being cast not from the sun but from the reflection off the building, amd I understanding that correctly? I used to make puppet shadows and mess with my dog. He would jump at the wall trying to grab them, it was a riot. How fun is this? A lot of things had to happen to make it possible lol.